The following review was done by Eric Geller from TheForce.net, another Star Wars website I help manage. I actually won the R2-D2 phone in a twitter contest by re-tweeting Eric's tweet! So for him to be able to use it ( as long as I get it back for the collection ) is very cool. Enjoy! 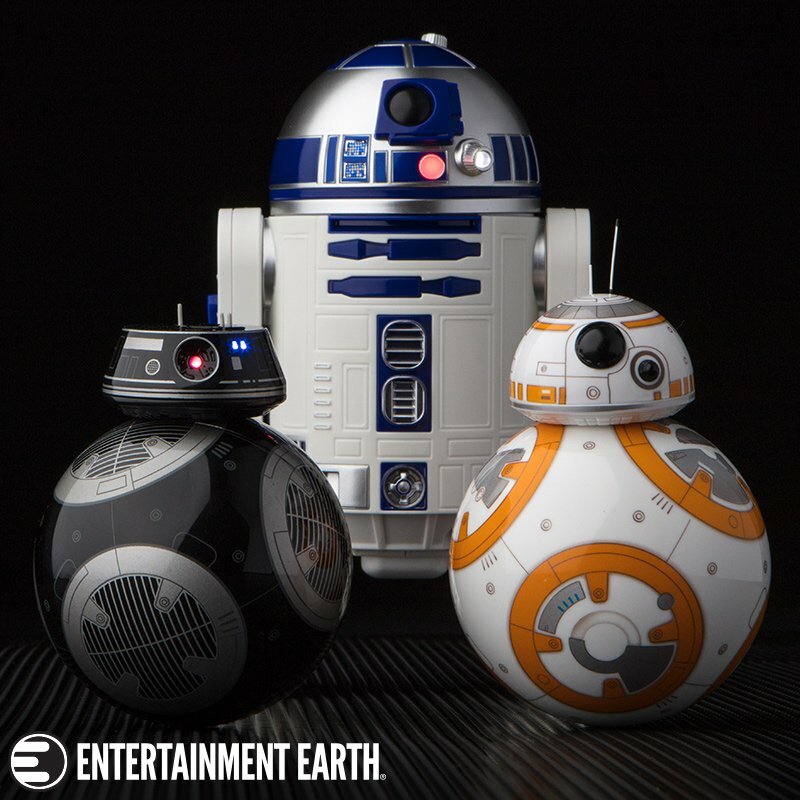 A few months ago, Motorola released a limited edition R2-D2-branded version of its Droid 2 smartphone. To promote the product, Verizon Wireless (the phone's exclusive carrier) gave away eight of them on Twitter, and then Motorola gave away five. Additionally, a limited number of midnight launch parties took place leading into the phone's September 30th debut. The devices were reported to be in limited supply, but we managed to score one through Motorola's giveaway. This device represents the first Star Wars-branded smartphone, and as such, it has a number of goodies that fans of the Galaxy Far, Far Away should appreciate. As our team's Senior Android Smartphone Nerd, I'll be reviewing the phone's exclusive pre-loaded Star Wars content. So, is this the Droid you're looking for? In my opinion, if you're a Star Wars fan already on the Verizon network, it's a pretty good option. A note about tech specs: Technologically speaking, this is just a branded variant of the Motorola Droid 2. If you're interested in learning about the phone's battery life, call quality, camera resolution, and other non-Star Wars stuff, you can get that information from tech sites like Engadget. As I said, I will only be discussing the phone's special Star Wars features. The front and back of the phone have design alterations from the standard Droid 2. 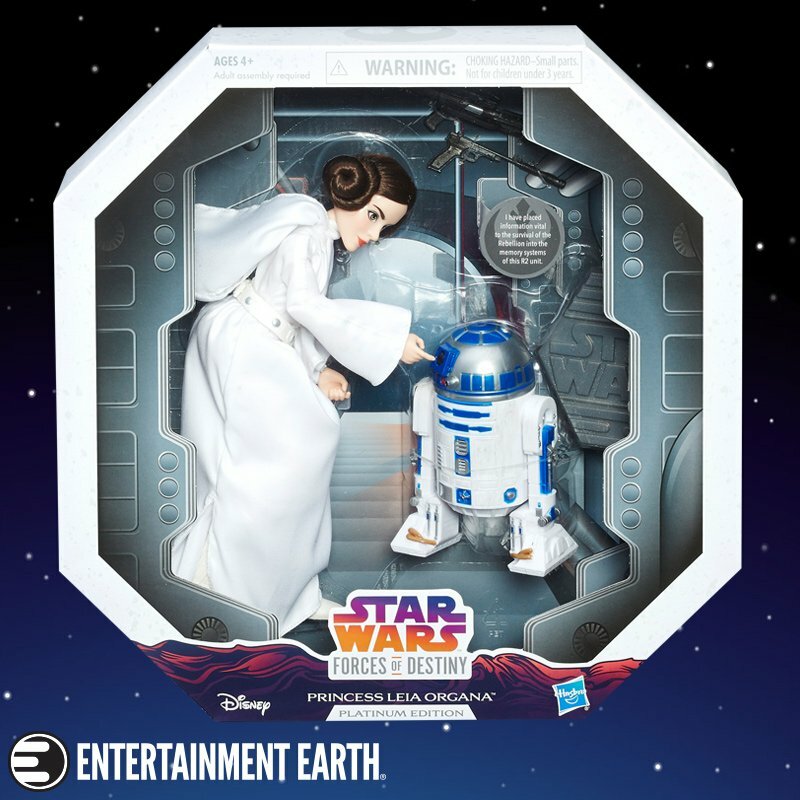 The front includes patterns on the top meant to resemble R2's circuitry, while the design on the back is much more extensive, as you can see above. When you turn on the phone, you get a special boot-up sequence featuring R2-D2 beeping as his software initializes. When the phone is locked, you will see two icons that you can slide to activate. Sliding the Rebel Alliance symbol will unlock the phone, while sliding the Galactic Empire symbol will turn phone sounds on and off. Judging from the name similarities, I bet Motorola referenced the soundboard too. The only Star Wars widget on the phone is a clock projected by R2-D2 that can sit on one of your home screens. There are no options to customize the widget, and given that the current time is always displayed in the notification bar at the top of the screen, it's pretty much just for show. This is the only standalone Star Wars app on the phone, and it took some investigating to make it do anything. When you launch the app, you'll be looking through a Rebel soldier's macrobinoculars at a pair of AT-ATs moving across the Hoth landscape. You can drag your finger up and down the green bar on the right to zoom in and out like you're using binoculars. And that's where I thought the functionality ended -- not exactly an interesting app. But when I turned while holding the phone, I noticed that the landscape turned with me. The app uses the phone's compass to adjust what you see as you spin the phone (and presumably yourself) around. When you tilt the phone, the view tilts accordingly, giving you the sense that you're actually there. Unfortunately, that is the extent of the app's functionality. The AT-ATs destroy a turret and the Rebel ion cannon fires, but that loops every so often if you keep the app open long enough. I would like to have seen more cool stuff in that app, such as elements within the landscape that you could click to unlock other stuff. It would be nice if they had included other macrobinocular views -- Luke surveying the Sand People comes to mind. Clicking this icon will open a video stored on the phone that features highlights from R2-D2's illustrious career in the Star Wars films and on The Clone Wars. The phone comes with a set of static and moving wallpapers that you can set as the background on your home screens. 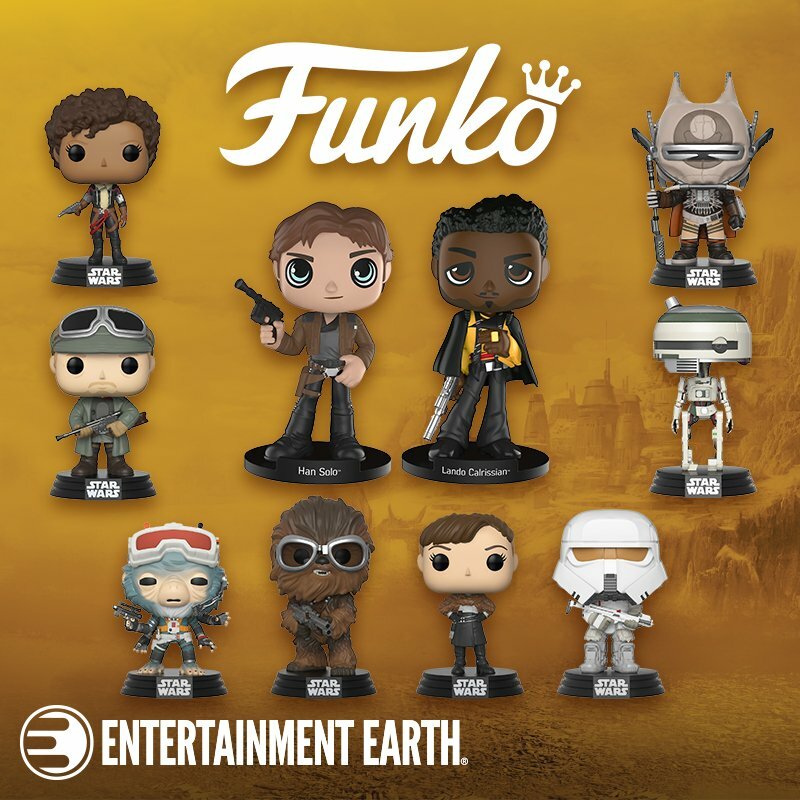 There are fourteen static images, including artwork of Yoda on Dagobah, the Rebel Alliance symbol, R2-D2's "torso," and a vintage-looking The Empire Strikes Back logo. The moving (or "live") wallpapers are much more fun. There are six Star Wars-specific choices, and three of them feature a degree of interactivity. 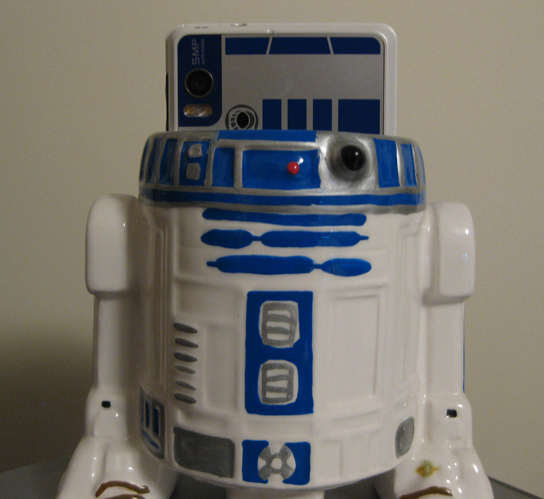 This special Droid R2-D2 phone dock is pretty neat. It features the product branding on the front and the Star Wars logo on the top surface, although the logo is obscured when you place your phone in the dock. It charges your phone and gives you a special "multimedia station" which can hold quick links to apps, but there's no special Star Wars docking functionality on the phone itself. Overall, I do enjoy the extra Star Wars goodies, even if they're not must-haves on a smartphone. Verizon customers who want to get a new smartphone should definitely check this one out, especially if they're already familiar with Android. The bonus content is minimal, but it's an admirable effort to reach out to Star Wars fans. If this kind of cross-promotion takes place again, I would like to see more special Star Wars apps. GPS, compass, and camera technology offer a variety of cool options for bonus content, as the binoculars app demonstrated. While there are already Android lightsaber apps, something more refined and official would be another great thing to include, perhaps with the ability to "duel" nearby friends. 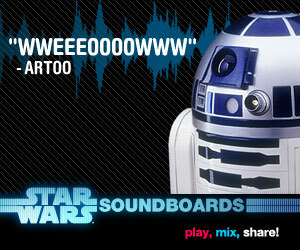 What about an Android-optimized version of the StarWars.com Soundboards (with the ability to use clips as ringtones)? These are good ideas that should not be wasted -- perhaps we'll see them as part of the Motorola Droid 3-PO.